TORONTO (AP) — Steven Stamkos had a happy homecoming in a game that included a frightening injury. Stamkos had a natural hat trick and the Tampa Bay Lightning beat Toronto 5-3 Wednesday night after Maple Leafs defenseman Paul Ranger was taken to the hospital. Ranger left the ice on a stretcher after his head hit the boards following a first-period hit from Alex Killorn. Ranger was "stable, conscious and alert," according to the Maple Leafs, after being taken to the hospital for what the team called a "precautionary assessment." Toronto announced the update on Ranger’s condition on its Twitter account during the second intermission. James Reimer gave up a goal on the first shot he faced, and the Maple Leafs lost their third straight. 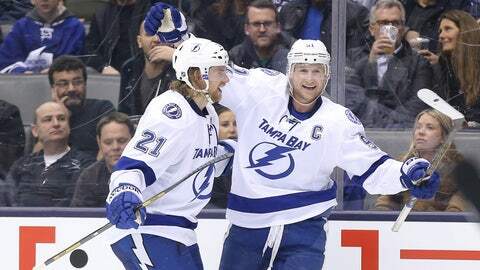 Stamkos, playing his seventh game since missing four months with a broken right leg, called getting the natural hat trick in front of family and friends the highlight of his season. "I was a little disappointed there was no hats on the ice," said Stamkos, a native of Markham, Ontario. "I guess I’ll take it anyway." Lightning coach Jon Cooper was impressed. "There’s special players out there that find a way. They have that innate ability to rise to the occasion," he said. "For Stammer to come back in here to his hometown and do what he did tonight, basically put the team on his shoulders, I can’t say enough about (him)." With 4.1 seconds left in the first period, Killorn boarded Ranger, who went down to the ice and remained there for roughly seven minutes before medical personnel put him on a stretcher and wheeled him off. Ranger moved his legs but not much else after the hit. Ranger’s teammates huddled around as attention was administered, and several Lightning players remained on the ice and watched from afar. Killorn was given a 5-minute major penalty for boarding and a game misconduct. The final 4.1 seconds of the period were postponed until after the ice was resurfaced. Ranger, who used to play for the Lightning, appeared to turn his head before the hit to see Killorn coming. When Killorn finished his check, Ranger’s head struck the glass hard. The hit immediately led to a scrum in the corner to Reimer’s right. That quickly gave way to trainers helping Ranger. "We say our job’s to get ready and prepare for the next period, but that’s scary," Maple Leafs wing Joffrey Lupul said. "He obviously didn’t look great when he was leaving the ice. So you’re trying to clear your head and focus on the next period. But you can’t lie — obviously part of you is wondering what’s going on with him." Ranger, who was dressed for the 48th game this season, has four goals and eight assists. The 29-year-old defenseman returned to the NHL this season after leaving his last team, the Lightning, early in the 2009-10 season. 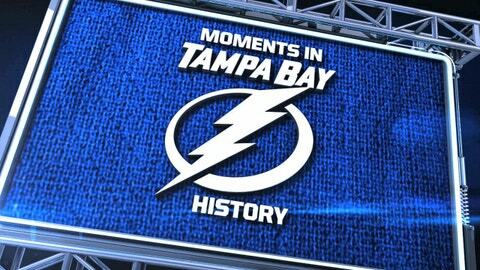 Watch clips of key moments that have helped shaped the Lightning through the years. Stamkos scored his three goals on three shots. Radko Gudas had Tampa Bay’s first goal 59 seconds into the first period from just inside the blue line. "The first goal’s kind of (a) fluke," Toronto coach Randy Carlyle said. "What do you do? It’s a seeing-eye shot, there’s a screen, it hits a post and goes in. So you can’t get too unraveled by that." Toronto answered with goals by Phil Kessel, his team-leading 35th of the season, and Nikolai Kulemin. After the Maple Leafs fell behind 4-2, Jake Gardiner scored in the third period, but Toronto could not beat Vezina Trophy candidate Ben Bishop (36 saves) again the rest of the night. Tyler Johnson added an insurance goal for the Lightning. The Maple Leafs were unable to score on Killorn’s penalty. Cooper called it "probably the turning point in the game." Less than a minute after the penalty expired, Stamkos got free again to complete the hat trick on his third shot of the night. It was his 19th goal of the season in his 23rd game. "A lot of things come down to special teams," Cooper said. "For us to kill off all those penalties, especially the 5 minutes and then get two power-play goals, that’s how you’re going to win. That’s how you’re going to win down the stretch and get into the playoffs." Reimer, who became the first Toronto goalie to start on back-to-back days this season, gave up three goals on eight shots and finished with 25 saves on 30 shots. "I just want to come out and play well and kind of be a difference-maker, and unfortunately it wasn’t the case," Reimer said. "I thought I made some good saves, but it definitely wasn’t the performance I was looking for." With Jonathan Bernier still out with a groin injury, Reimer’s play has been center stage for the Maple Leafs, especially after Carlyle called his play Tuesday night in Detroit "just OK." Reimer disagreed with that assessment, and his agent chimed in on Twitter. "As is customary in Toronto, when your team plays poor defensively game after game you blame your goalie," Ray Petkau wrote. Petkau used a couple of other tweets to clarify that he meant it as a general observation, not a reaction to the postgame comments. On Wednesday, he issued a statement in an attempt to further explain. NOTES: Toronto dressed seven defensemen and 11 forwards for the 12th time in the past 13 games. That meant Colton Orr and Carter Ashton were healthy scratches up front.